From left to right: Daniela Kostova “Souvenir from Warsaw”, archival print, 2010 (from the exhibition "Unorthodox Image” curated by Kamil-Julian Malinowski and presented by Foundation 93 at Hotel Europejski in Warsaw, Poland 2010). Eastern Exterminating fumigation tent. The second photograph, created by Eastern Exterminating, a South Florida pest extermination company, depicts the company’s fumigation in Germany of a 400-year-old church, which was infested with termites. The company was brought in because of its ability to create tents over complex structures to more effectively eliminate pests. A pile of newspapers is arranged in the alcove of the reading area at Clark. A graphite line drawn on the wall encircles them, serving as a kind of measuring gauge. 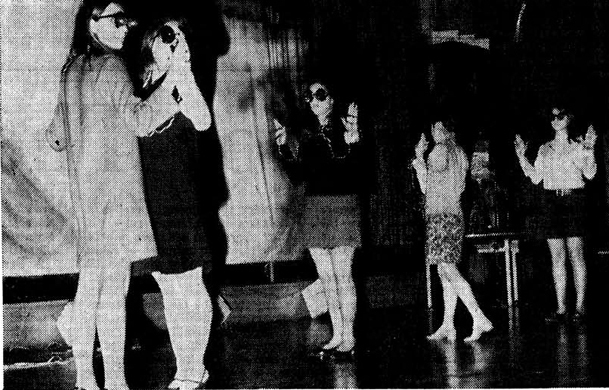 Two black and white text-based drawings hung on the wall above them read: “Three thousand copies of this publication are stacked in the gallery. Anyone is welcome to take one until none remain. 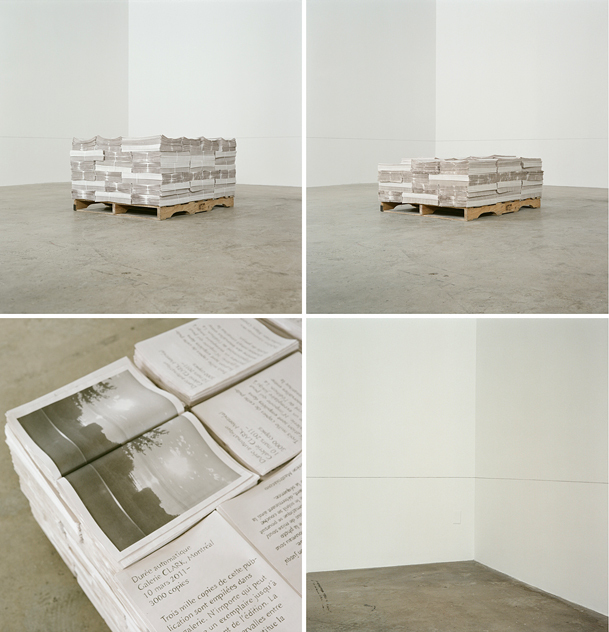 The intervals between each removal join together to constitute the duration of the work.” On the cover, one can read a description of the process that led to the production of the images presented within the pages of the publication. These consist of 32 black and white photographs of a sunset from Kamouraska, Québec, documented in just less than two hours on June 25, 2010. Though it may not seem obvious at first, Situation: Auto Duration (CLARK, March 10, 2011 – to be determined) astutely addresses several principles that form the basis of artistic experience, namely those that relate to the context of presentation (the exhibition), artistic creation (the role of the author), and its reception (the responsibility of the public). 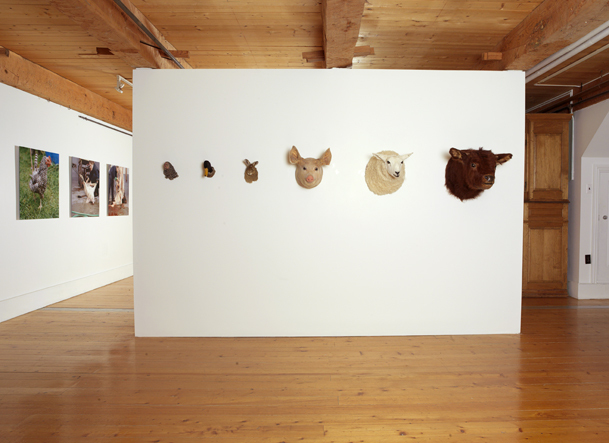 Kim Waldron, installation of "Animal Heads" at the exhibition "La Colonie", 2010. In the photograph Bleeding Out (2010), the Montreal-based artist Kim Waldron, dressed simply in a blue quilted vest and plain overalls, stands over the limp body of a sheep lying in its own blood. Behind her are another animal’s bisected carcass and a plastic bin. Nearby there is a broom. The floor is roughly poured concrete. Three distinct handprints made in blood immediately suggest that she has just killed this animal. She has. Her gaze is focused on the broken animal at her feet. Her puzzling facial expression could be read as pensive, troubled, bemused or satisfied. She is in an abattoir. 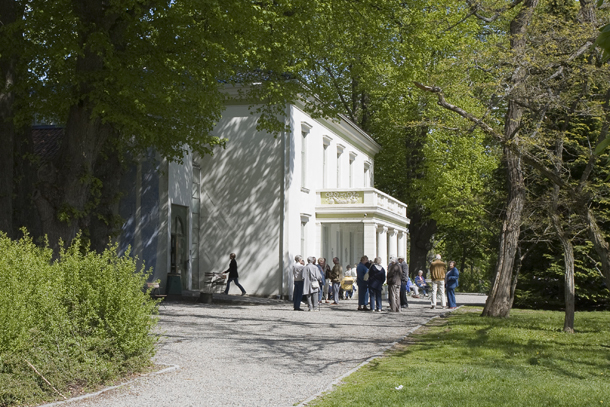 In this case, temporarily at least, it is also the artist’s studio. Lynne Cohen, "Untitled (Police Balloons)". When Andy Adams told me that Flak Photo was running a WEEKEND series in January concentrating on Lynne Cohen’s work from her new book Cover, and asked if I’d be willing to “interview” her asynchronously through the web, I leaped at the chance to connect with an artist I’ve admired from a distance since the 1980s. She was gracious to accommodate my questions while suffering the inconvenience of a bruised or broken rib, which kept her from laughing too much. 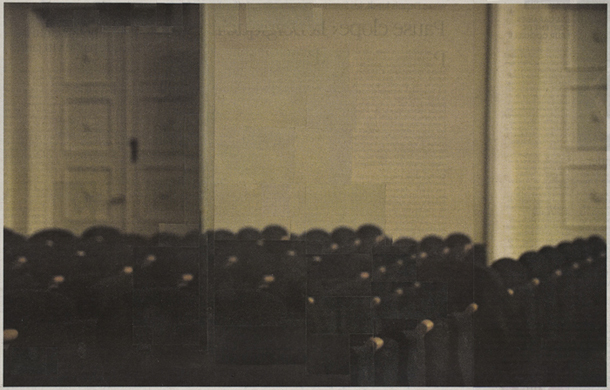 As I realized, the more I looked at her work and after I had a chance to speak with Lynne and hear a recording of her lecturing, not laughing is a significant encumbrance for her. Her work is profoundly, disturbingly funny. David Byrne wrote an essay for her first book, which tells you something about the role of absurdity and surrealism in her creative mission. You can find out more about her biography on her web site; here’s an edited record of our electronic exchanges, which appears here with great help from Andrew Lugg. 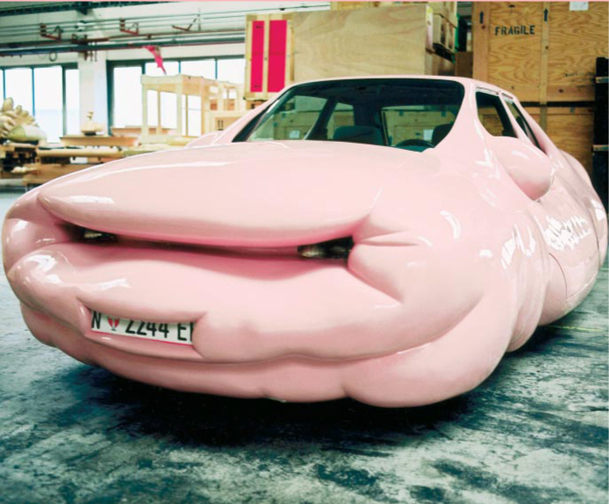 Erwin Wurm, "Fat Car", 2002.